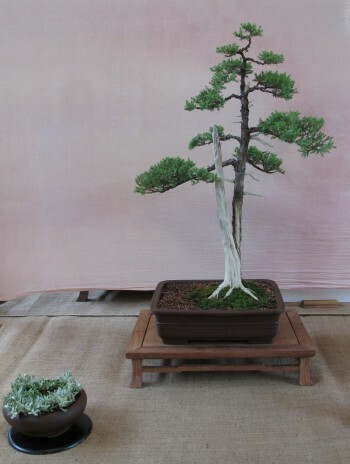 If you live in the Chicagoland area, and you’re either into Bonsai (those little trees) or you’re curious about it, there’s a Bonsai show on this weekend at Morton Arboretum (near highway 88 and 355) that’s well worth a visit. We attended today, and were most impressed. Some of the displays left a bit to be desired in previous years (trees on tables by the windows, with some glare and distractions from outside), but they did a great job this year! Nearly all the trees were setup on high tables away from the windows, with nice backing and accent plants. They had a good variety of trees, and encouraged visitors to vote for their favourite tree. I also attended the afternoon demonstration where one of the members worked on a large pine. That was quite informative, and the crowd seemed engaged and could follow what the presenter was doing. The show runs all day on July 16th-17th. I’m hoping the continued success of the show will encourage the Arboretum to one day acquire their own collection and give the Chicago Botanic Garden some friendly competition. It’s surprising that a garden that prides itself on its full-size trees doesn’t yet have their own Bonsai collection! That said, I highly recommend visiting Morton Arboretum just to take in the astounding variety of trees and landscaping. The autumn colour is especially spectacular!